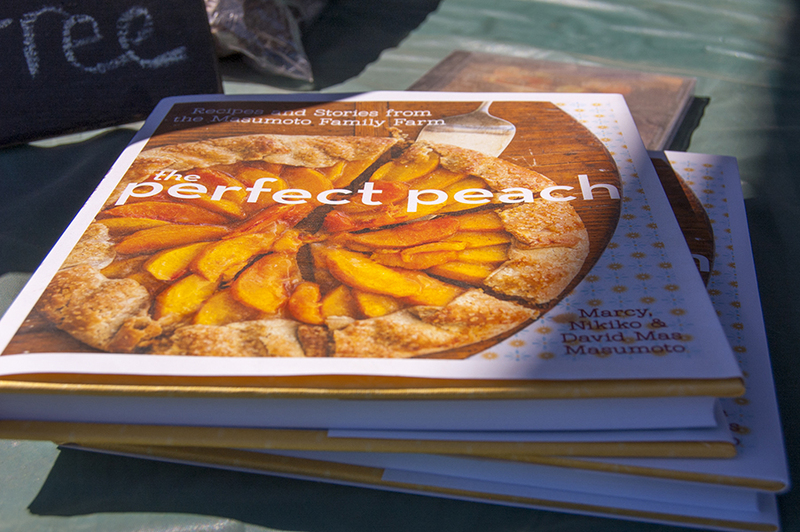 This month marks the five-year anniversary of The Perfect Peach, a collection of recipes and stories from the Masumoto Family Farm. It feels funny to say that a cookbook has deeply touched my life in all aspects. But in the case of The Perfect Peach, this statement is true. The literary cookbook is co-authored by Mas, Marcy, and Nikiko Masumoto, and it’s filled with dozens of delectable recipes for your summertime haul of Central Valley peaches. The book is also filled with passionate and contemplative stories of what peaches mean to this California farm family. The essays interwoven with the recipes not only provide a “peach primer” for those unfamiliar with the world of the Masumoto Family Farm, but they also offer, to me, a glimpse into what it means to love something so much that it seeps in your bones. I used to freelance for public radio and various publications, and in my reporting adventures I got to review The Perfect Peach for the former Fresno Life Magazine. The finished story, entitled Peaches as Performance, focused on conversations with Marcy and Nikiko about the creation of the book and about the intersections of food and culture, a subject that deeply resonates for a multi-generational, multi-racial farm family. I will never forget my conversations with the Masumoto family in Mas and Marcy’s kitchen that day, June 11, 2013. In my mind, it was the moment where I went from being a Masumoto fanboy and admirer to being a Masumoto friend and collaborator. As with any reporting assignment, I walked away that day with a ton of interview material that was left on the cutting room floor, recorded in high-quality audio to my trusty Marantz PMD-661 digital recorder. The FLM review of the book, in fact, didn’t even include my short but profound conversation with Mas, where he talked with me very candidly about the urge to write and the urge to work, in relation to his own health and mortality. I hope in the future to revisit the recordings again, to pull more snapshots out of the archive and bring them into the present. But for now, and in honor of the fifth anniversary of The Perfect Peach, I am happy to share the following recording of Mas. He reads what I like to think of as an impromptu poem, “Names of Old Friends,” inspired by the names of the peach varieties in his essay of the same name in the book. About a month ago, when I was first sitting down to dig through the archive recordings to revisit the conversations with the Masumotos and recover this gem of a poem by Mas, my wife Tracy pulled the very last baggie of our 2017 Masumoto peaches out of the freezer. She had spent hours last summer preserving the fruits of our volunteering on the Masumoto Family Farm, and we had been rewarded throughout the fall, winter, and spring for Tracy’s work. She asked me what I wanted her to make from The Perfect Peach, with our last bit of last year’s peaches. I didn’t hesitate to request the peach shortcakes, which feature a hearty and savory biscuit, a light whipped cream, and of course a generous helping of Masumoto peaches in their own very light simple syrup. As Nikiko suggests in the cookbook, Tracy and I didn’t hesitate to eat this incredible treat with both breakfast AND lunch that day! And why not? The 2018 harvest has just begun. There will be more peaches and more beautiful peach adventures in the next three months.